Heritage :: Hambrock Electric, Inc. According to the University of North Carolina at Asheville’s Family Business Forum, only three percent of all family businesses operate beyond the fourth generation. 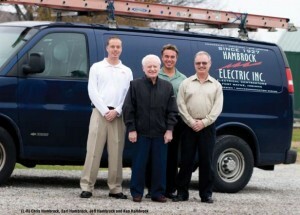 Hambrock Electric Inc. of Fort Wayne is proud to be a family owned business operating at the fourth generation now, with plans to expand the company and reach the 100-year mark and beyond with the fifth generation. Their secret? Persevering during the tough times and building solid business relationships. The company specializes in commercial, industrial and retail design/build projects. 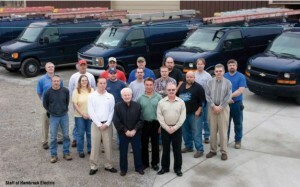 “We provide power distribution, building lighting, parking lot lighting, backup generators and a certified turnkey structured cabling for networking, voice systems and fire alarms. Plus, we offer maintenance after the projects are complete,” says Vice President Jeff Hambrock. Jeff’s grandfather, 82-year-old Earl Hambrock, proudly claims that his dad (and the company’s founder), Carl W. Hambrock, would “turn over in his grave to see what this company has done.” That is because when Carl opened his Electric Shop in Fort Wayne in 1927, he was the only employee except for the help he received from his sons, Earl and Bill. In 1948 Earl and Bill took over the business. It was not long before they established a relationship with their first major client, Rogers Markets Inc., Fort Wayne’s then-dominant grocery store chain. “We did a lot of work for Rogers, such as new builds, remodels and maintenance,” Earl says. Their clientele also included the original Fort Wayne National Bank downtown, Corning Glass in Bluffton, Kerr Glass in Dunkirk and Lutheran Homes in Fort Wayne. Ten years passed before he had gained enough business to hire an employee to answer the phone and do other office duties so he and his wife, Judy, who worked with the books and answered the phone, could get some time away from the everyday pressure of running the business. At one point, the company was up to 35 employees. It maintained the Rogers Markets account and in the 1980s, it developed relationships with two more major clients, Scott’s Foods and France Stone/Hanson Aggregates. For a while, the company maintained a good working relationship with both Rogers Markets and Scott’s Foods. In 1991, SuperValu acquired Scott’s Foods and a few years later it acquired Rogers Markets. “Our company was able to continue a good relationship with SuperValu through all those changes,” Ken says. Along the way, Ken’s sons, Jeff and Chris, learned the trade. Although 9/11 hurt the commercial industry, and Hambrock’s employee base dropped to 18, the Hambrocks kept plugging away. “We maintained most of the existing customers and established relationships with new customers to start the rebuilding process over again, only this time with help from Jeff and Chris,” explains Ken. Perseverance and time have proven to build not only customers but also employees—currently, Hambrock Electric has 28 employees. The company started doing many design/build projects while Jeff and Chris were working in the field, but it got more involved in its own computer-aided design (CAD) drawings when Jeff began working in the office. While Jeff and Chris each own just 18 percent of the company, as vice presidents, they have essentially been running the business for the last two years, developing contacts with new clients Ken never had and emulating what he taught them about relationships.